ATB Chartered Accountants are tax accounting professionals with over 80 years combined knowledge and experience. 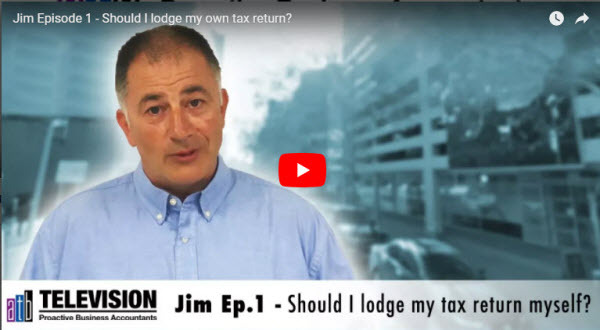 In this very first episode of ‘Lodging Your Tax Return’, Director Jim Vass considers the option of lodging a tax return yourself versus the benefits of using a tax accounting professional. Tax season can be an extremely stressful time of year. Tax regulations and compliance requirements can change each year, making it harder for you to know what you can legally claim. As tax accounting professionals, ATB Chartered Accountants know the right questions to ask to maximise your deductions, while ensuring that all of your tax activities are compliant and legal. If you’re going to be paying tax, that tax is going to be payable usually within a month of you receiving your assessments. Alternatively you could get a tax professional to help you out. The tax office acknowledges that tax professionals have a lot of tax returns to process, and the ATO can offer an extension to the deadlines. Understanding what can and can’t be claimed as a tax deduction is critical in maximising the deductions in your tax return. Tax professionals can help you identify potential deductions and maximise your return. The number one reason to use a tax professional is because we’re great at what we do. We know the current rules and regulations, the easiest ways to record and report your finances and we can guarantee maximum refunds for you. Contact ATB Chartered Accountants now to discuss your Tax needs. Coming up Next – Episode 2 – What is regarded as income? In our next episode, Jim discusses what is regarded as income for the purpose of tax returns. This video is made without consideration of any specific client’s investment objectives, financial situation or needs. Those acting upon such information without first consulting one of ATB’s advisors do so entirely at their own risk.